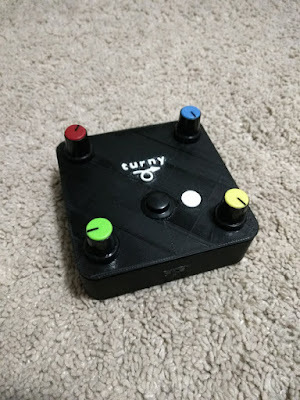 With Global Game Jam 2018 coming up soon, I had the idea of building an alternative video game controller for which I could design a game for during the jam. I recently got my hands on an Adafruit Bluefruit LE m0 Featherboard, an Arduino-compatible microcontroller with built-in low-energy bluetooth module and I was quite keen to try and find a project to test it out on. I started thinking of types of control mechanisms that you don't really find on modern, conventional game controllers: I didn't really have too much time to try and use something really exotic that I'd have to order in, so I ended up thinking about paddles. Old games controllers dating back to the 1970's commonly used a single paddle, or rotational knob, for example on the Magnavox Odyssey and the Atari 2600. The original arcade version of Pong, one of the first video games used two potentiometer knob controllers for two player controller of in-game "paddles" (hence the origin of the term, in relation to the on-screen object the players control). No modern game controllers seem to use paddles or knobs anymore. I had a bunch of spare potentiometers sitting around, so I decided that I'd base the controller around a group of these rotational inputs. I started off by testing out the bluefruit featherboard; I soldered on the headers, downloaded the appropriate packages for this board for use with the Arduino IDE. Connected it up and got the blink sketch working. 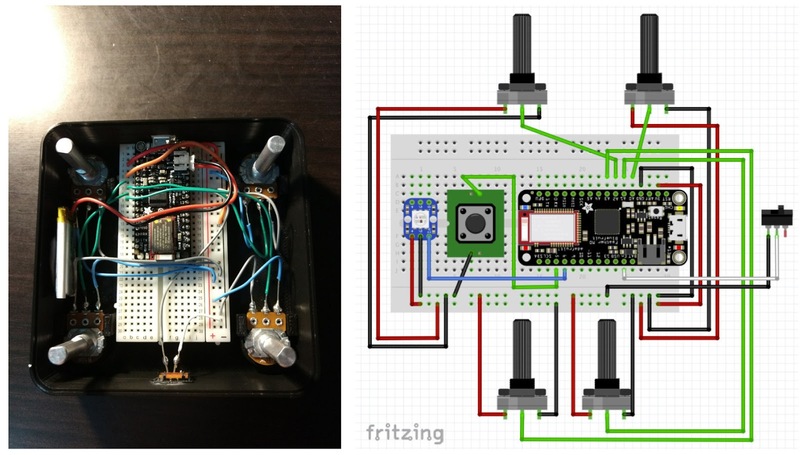 I downloaded the Arduino bluefruit library and uploaded and ran the "controller" sketch from the examples that came with the library. I then installed the Adafruit Bluefruit LE Connect app on my android phone and connected to the featherboard. Messages all appearing normally on the serial console when selecting colours in the app. I then modified this sketch to colour a Neopixel based on the colour received through the colour picker function. I connected a neopixel up to PIN 5 and everything working well. I also downloaded the Adafruit BLE desktop app for OSX and tested the connection was working smoothly between the featherboard and my laptop, all good. I found this library for interfacing on the desktop end via python. I tested the provided example 'list_uarts.py'; was working correctly to find the featherboard when it was switched on. I used this code as the basis for integrating communications with the bluetooth module in a pygame loop. I had to embed all of the code to connect to the device and continuously poll data into a separate thread which was called from a Scene/Director class and dumps the latest polled controller data into variables that gets read by the game during an event call. Everything seemed to work ok; perhaps a little bit laggy (approx. 100-200 ms of lag), but it's hard to tell. 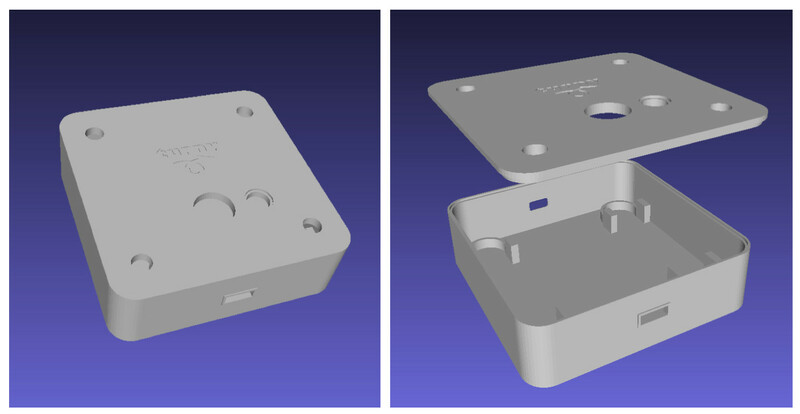 I started designing a 3D printed case: I wanted to design something that was relatively quick to knock up in OpenSCAD: basically just a box with four pots, one each corner. I added space for a panel mounted momentary button in the middle on top and a hole from which I would mount a neopixel shining up to provide some feedback to the player for when the controller was connected/searching for a connection, or perhaps to use as indicators during a game. I printed a separate thin white circle that would sit on top of this hole (superglued on) to help diffuse the light coming from the neopixel. I also added holes on the sides for both a power on/off switch and the usb port for charging the battery via the featherboard. 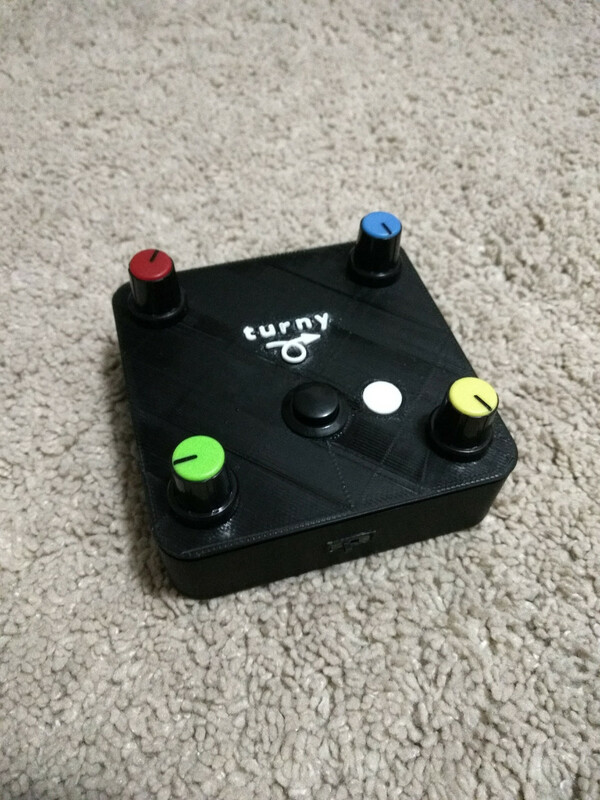 I designed a little logo to go on the top of the controller: I placed an imprint of this into the case model and separately printed (in a different colour) a solid version of the logo text that I could superglue on top of the imprint, to make it readable. I connected up all of the electronics on a breadboard circuit to test everything was working ok. I connected the four potentiometers through to four analog input pins on the featherboard, a momentary button to a pull-up enabled GPIO input pin, the neopixel to one of the GPIO output pins, and a slide switch connecting the ground and enable pins on the featherboard. 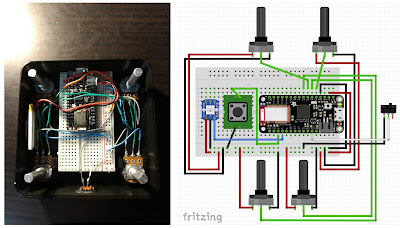 For the final electronics, I ended up designing everything around a small solderless breadboard which housed the featherboard; I wanted to be able to easily salvage out this board for future projects, and it meant a little less time soldering too. Once I had all the parts printed and electronics wired up, I glued it all together. I wrote a little demo python script using pygame to connect to the controller and display a series of coloured panels corresponding to each of the rotational values of each potentiometer, just to test everything was working OK. So far, my plan is to perhaps use this as a controller to design a game around for the upcoming Global Game Jam in a few days: I've thought of a couple of little "mini-game" ideas like a physics-based game where the knobs control the position of little trapdoors, or perhaps a tower defence game where the knobs control the viewing direction of little defence towers ... will have to see what the theme is when it is announced! If I do end up making a game for it (I'm sure I will), I'll post about it. Code for running a pygame demo on a desktop/laptop that connects to the controller: to be uploaded. Based in Sydney, Australia. I enjoy making games, tinkering with electronics, programming and music.